Hello everyone! Today I'm here with Day Seven of my Christmas Card series of this year. Today I'm doing some watercoloring with Distress Inks and Zig Clean Colour Real Brush Pens along with some newer stamps by Mama Elephant. So to start off my card I started off with a piece of Watercolour Cardstock by Tim Holtz and stamped out my leaves from the Mama Elephant - Twinkle Towns set using my MISTI tool and my Distress Ink in the colour Twisted Citron. Once that was stamped out, I taped my watercolour piece to a hard surface (I use a cheap chopping board from Kmart). I then smooshed my Twisted Citron and Mowed Lawn Distress Inks onto a slick surface and began to watercolour over the leaves. I did a wash of the Twisted Citron first and then darkened it up a little bit making some shadows with the Mowed Lawn. Once that was done, I dried it off with my heat tool and then stamped out the branches using the Antique Linen ink. I again repeated the same steps but instead smooshing out Gathered Twigs and Walnut Stain from the Distress Ink line. I then quickly watercoloured over the branches using Gathered Twigs as the lightest and Walnut Stain as the darkest. I then dried that completely using my heat tool and moved on. 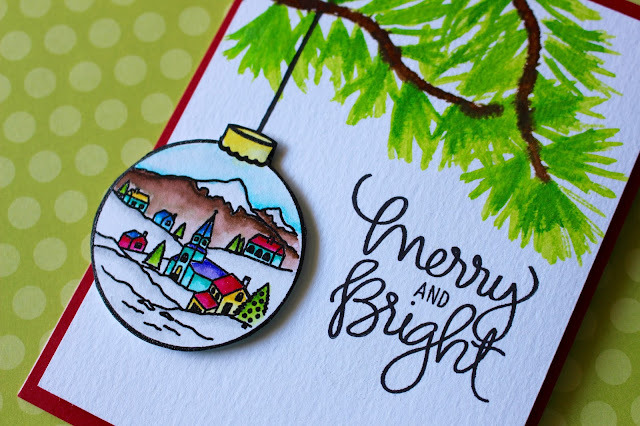 I then stamped out the Merry and Bright sentiment from the Jingle Greetings stamp set with some Versafine Onyx Black Ink also. For the ornament I stamped that out and the scene inside using Versafine Onyx Black Ink again, but since I was going to watercolour over it I poured over Clear Embossing Powder by Simon Says Stamp and heat set it with my heat tool. I coloured this image in with my Zig Clean Colour Real Brush Pens - all the colours will be linked below, by the way. My favourite way to use them pens is to use a damp brush to spread the colour and to work in small sections to be able to work faster. That's one of the best ways personally for me to use them. So anyways, once it was all coloured in I just used my heat tool once again to dry it completely. I then was going to use the die to cut it out but used my scissors instead since the die moved as I ran it through my die cut machine. I then stamped out the line that comes in the stamp set twice onto my card to make the string for the ornament. 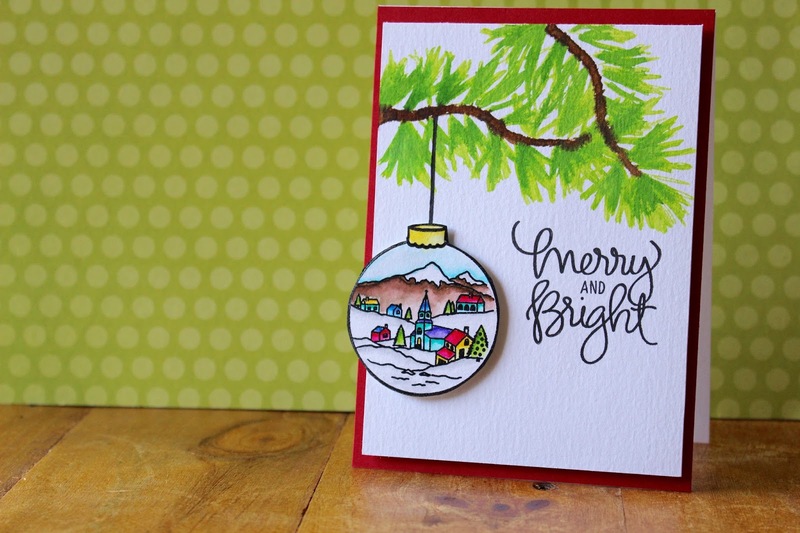 I then used some 3M Foam Adhesive to adhere the ornament onto my card. I then grabbed some Fun Foam to adhere to the back of my panel to make it nice and sturdy. I then grabbed a card base which is made out of Neenah cardstock and is cut to 4" x 11" and scored at 5 1/2" to make a 4" x 5 1/2" card. I then cut a piece of Lipstick Red Cardstock by Simon Says Stamp to 4" x 5 1/2" as well and cut out the middle section (just to save on cardstock) and then adhered it to my cardbase. I then adhered my panel onto the cardbase as well and that finished up my card. I hope you enjoyed the video and card for today. I'd love to know what you thought of the card today either here or at Youtube - I really love to hear your feedback!